Omaji and The Council of Light will share Upgrades, Transmissions of Light, Attunements and Activations to Support you in the Embodiment of Your Soul's Passion and Purpose in the Purest Frequency and Form. Is it TIME to EnJOY and Remember what you Came here to BE Have and Express? ARE you Ready to Feel more JOYFUL, Expanded and FREE HERE in this Realm as the Infinite Being that you ARE - Fully Aligned with your Unique NOTE and Reason for Being? A component of what is shared will be simply to ACCESS the POWER and POTENTCY OF YOU without LIMITS. We INVITE GRACE and EASE as we Choose together to Remember and to ACCESS this Accleration and Momentum into Higher Octaves of Expression. Each session is a multi-dimensional Transmission of Light that continues to offer support well beyond the first interaction. Each time you listen, you receive more of what is there for you to receive. The last 30 minutes of each session will be open for interactive Q&A so you have the ability to ask questions and interact LIVE during each session. Will you join us in this Co-Creation of LIBERATION into your FULL EXPRESSION of YOU? 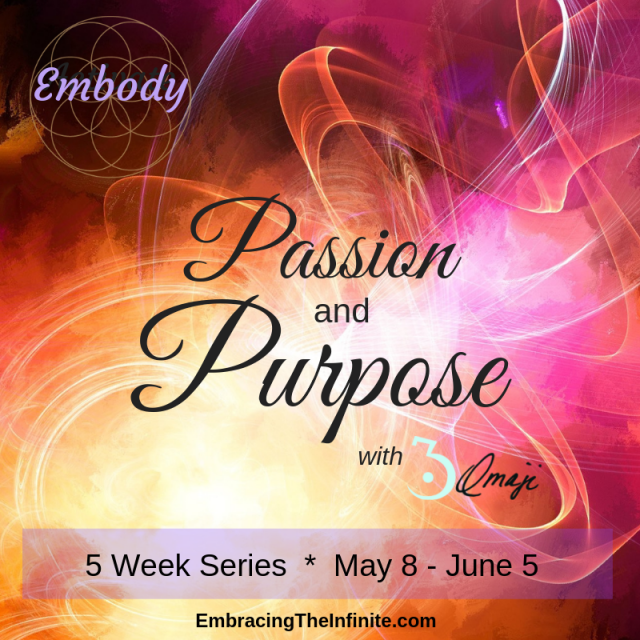 Did you know that there will be a FREE Activation Intro to this series on May 5th? You can sign up to participate FREE here. "Thanks to the sessions with Omaji, I now wake up in the morning feeling more peaceful and more grounded than I ever have before, whereas I used to wake up with my stomach in knots. I feel like I'm beginning to experience the Truth within my being - It's so awesome!" ~ S.C., Florida.